I love a good craft challenge or blog hop- every now and then I need a creative kick in the pants, you know? So today I’m participating in the Industrial Chic Blog Hop and can’t wait to show you what I made! 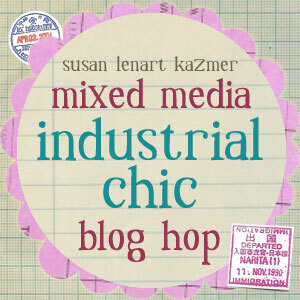 Industrial Chic is a Michaels® Exclusive by Susan Lenart Kazmer™. A variety of ready-made elements combine to make these unique industrial pieces inspired by urban chic designs. Industrial Chic™ is a found object jewelry component collection designed by mixed media artist Susan Lenart Kazmer, and manufactured by Horizon Group USA. Industrial Chic™ was created for jewelry designers of all levels. Become your very own builder of talisman. Pendants, charms, findings, and chain are available in several finishes to mix and match to create your own individual style. Each charm, a work of art. Each pendant, a reminder of a life past. Each piece, a journey of its own. Created by Susan Lenart Kazmer for you to become a designer of the Industrial Chic™ look yourself. I have long admired Susan and her work- it’s amazing. So now I’ll show you what I made! I was captivated by the frames….they just drew me in! I used a “Lucky Money” Chinese money envelope and the Ice Resin with the frame to create a focal component. I used the envelope to make a focal component with the frame. I added some glass microbeads to the uncured resin as well. Then I used some other Industrial Chic components to make the necklace. (Yes, I did make a run to Michael’s for more stuff!) I also created some of my own charms using a bead cap and some stray glass beads. I really like the finished piece- who’da thunk that it started off as an envelope?? Make sure you head over to see the rest of the participants in the hop! Disclosure: materials shown were provided. Great job, Jenny! I just love what you pulled together! Looks awesome Jenny…if only we had Michel’s in Australia!!! That is awesome Jenny! Thanks for sharing. I really love her stuff and love what you created! I have a pendant of hers sitting right here on my desk ready to be worked on. What a fun fun necklace! I love the way you have the mixed beads on each side. And just recently having moved to Asia – I am addicted to the money envelopes! Oooh – love, love this necklace! Love the mixture of beads, colors, and the charms! Love it Jenny. The envelope looks great and your ICE Resin skills have gotten fabuuuulous dahling! Gorgeous way to rock the bezel. I may have to make a run to get that bezel set, now. Using the envelope as the prime component is simple brilliance. Lovely!